So now that we've wiped our schedule clean, we have absolutely no obligations to be anywhere, anytime. For the first time in months, it feels like we've got some breathing room. However there are still some things that need attending to. First and foremost, we've got to check out Neda's mole. It's grown quite large in the last few weeks and now looks like a Smartie that's been glued onto her back. Based on all the Google Image medical searches that I've been doing over the last few days, I've been very concerned that it might be something serious. There wasn't anything we could do over the weekend except send out some feelers to all of our German friends asking for advice for dermatologists that they could recommend. We even considered riding to Italy because Neda's brother-in-law works in a hospital in Milan. But we decided to give Munich a try first. It's only an hour and a half away from Hechlingen, and we researched some English-speaking dermatology drop-in clinics beforehand on the Internet. Riding around Munich. We keep coming back to this city over and over again, like it's a central node in our travels. The clinic we visited was right in the city and at first the receptionist wanted to book us an appointment later on in the week. But after talking to the doctor directly, we managed to convince them to see us right away. I sat nervously in the waiting area as Neda disappeared into one of the examination rooms. I thumbed through some German magazines but I wasn't really looking at any of them. My mind was occupied by what the diagnosis would be. 45 suspenseful minutes later and Neda reappeared in the lobby outside the waiting room. Through the glass wall she smiled at me and gave me the thumbs up. As I joined her at the receptionist desk, she told me that the dermatologist said it looked like a benign growth and that they quickly removed it and would send it away for analysis. But she reassured us that we needn't worry about it too much. We walked out of the office and into the city streets of Munich with a million pound weight off our shoulders. And best of all, we had nowhere to be! Best feeling in the world right now!!! Walking back to the bikes, I put my arm around my wife: "Well, where are we off to now, my little Smartie?" She shot me an icy glare and raised her index finger between us. "No. Just... NO." Hm. Too soon, even for a little nervous-relief humour...? The whole city is bustling with activity, preparing for Oktberfest activities this afternoon. With the way that we're feeling, we know that this is *NOT* what we want to be doing. 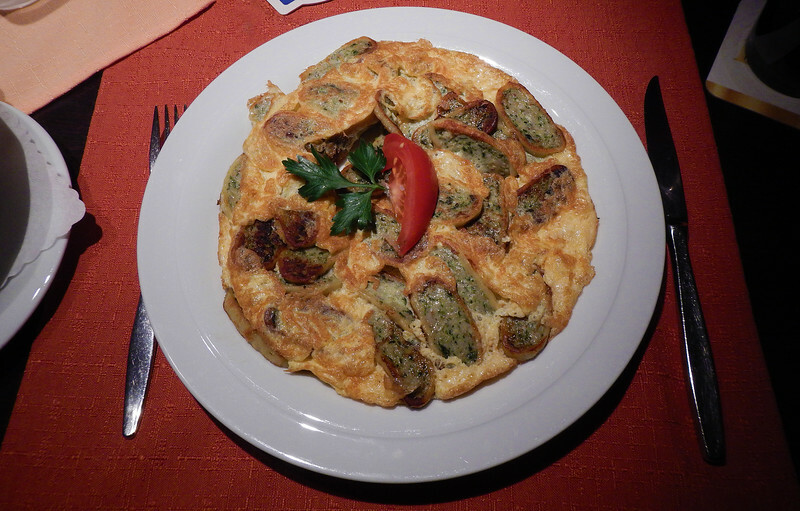 Crowds and over-priced food is just not a good salve for our travel-weary souls. So, instead we're going to continue the theme of catching up on maintenance, this time for our motorcycles. And what better place to do it than the land of BMWs? 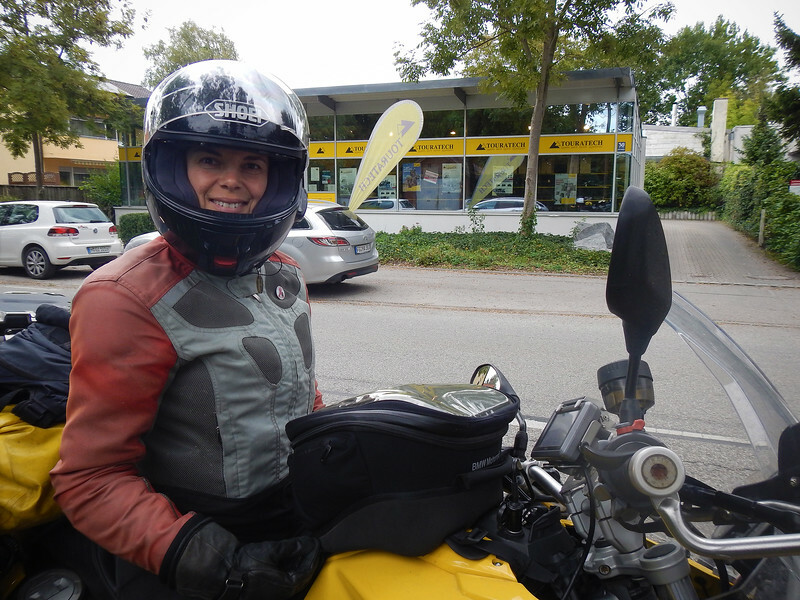 We rode over to the BMW Zentrum store to pick up a new pair of riding boots for me, since the ones I've been wearing have not been waterproof since Norway. 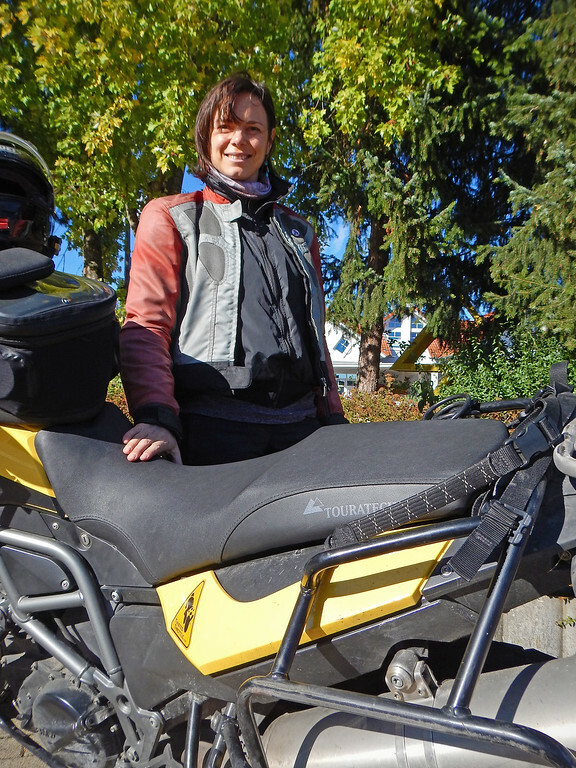 Then we went to the Touratech store just outside the downtown area to see what they could do about re-waterproofing Neda's leaky Zega Pro panniers. The salesguy told us that it if we left it with him, he could have the panniers fixed by next week. That seemed like a bit too long, and when pressed, he told us that they didn't really do any repairs in the Munich shop. 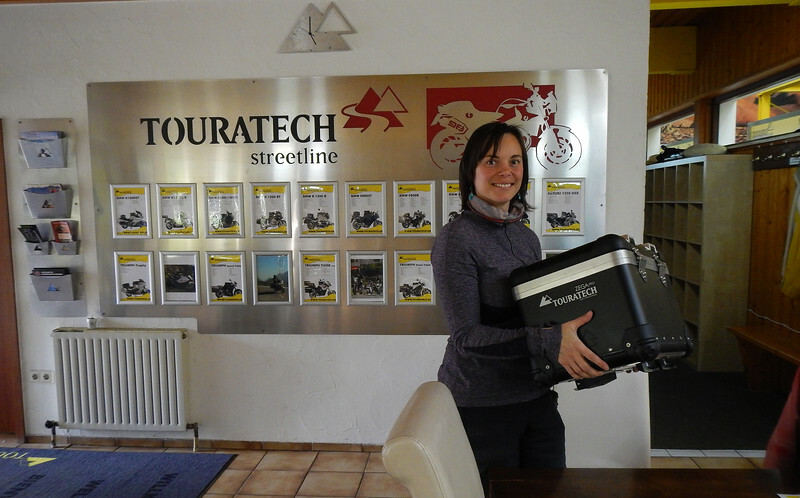 They actually shipped all the stuff to the real Touratech HQ in Niedereschach, which was a few hours to the west of us. He told us if we brought it to the HQ ourselves, they could probably do it in a day or so. That seemed to be the better solution, so we're going to Niederescach then! We arrived at the Touratech HQ just as it was closing for the evening. They told us to return the next day and helped book us a hotel in a town nearby. So we came back bright and early the next morning, eager to get Neda's panniers fixed. We originally contacted Corbin (the manufacturer of the seat) to see if there was anything they could do. They forwarded us to their Sales department and told us to buy a new seat. Basically they told us to F-Off. Okay, message received. We'll take our business somewhere else. 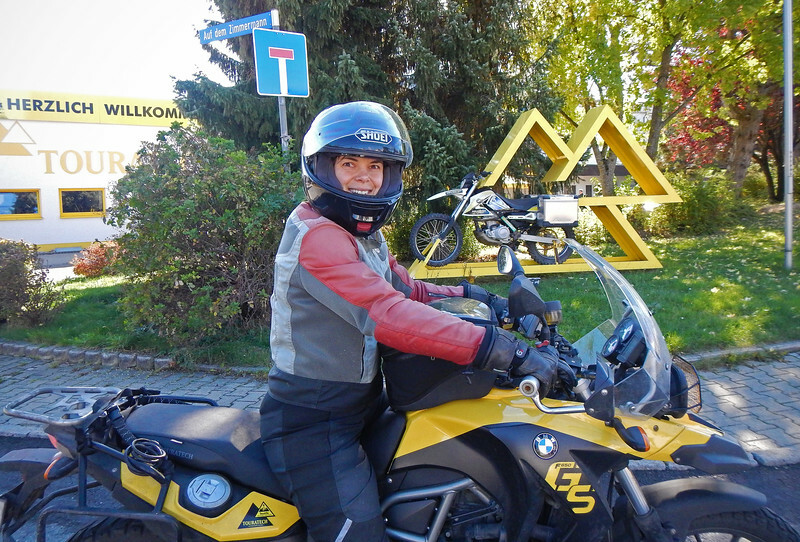 Niederescach is located in the Black Forest region of Germany, which is well-known for it's scenic, twisty roads and the Touratech guys lent Neda a map with all the good routes in the area where she could test out the seat. They were very accommodating. After a couple of hours, Neda returned. 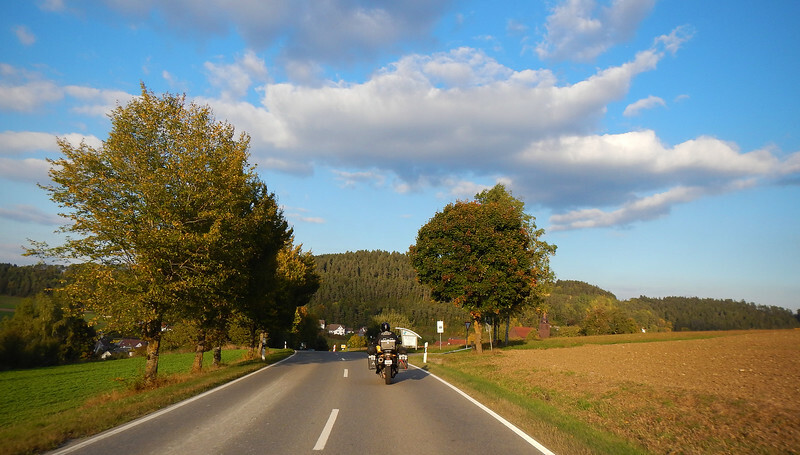 She had a blast riding around the Black Forest on her own. She told me that she's scoped out a couple of roads and places that she wants to take me to later. 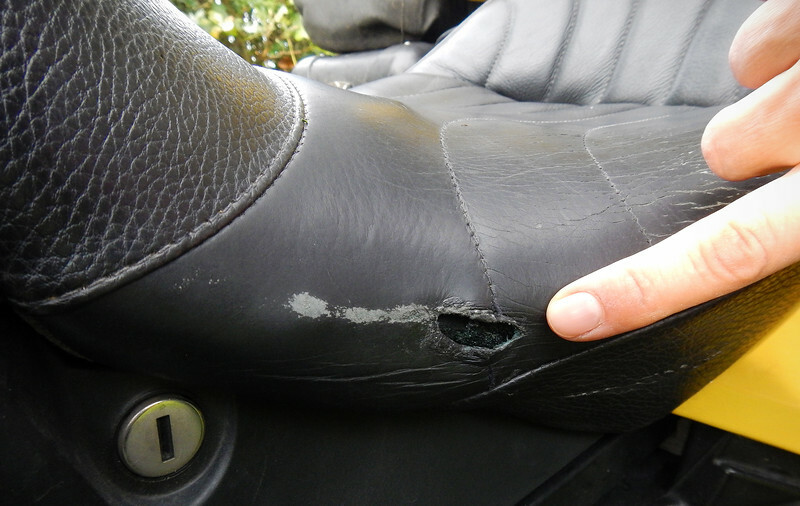 Unfortunately, the Touratech seat was not what she was looking for. She said that for the first hour it was okay, but after that, she was squirming because the seat is very hard (it's really an Enduro seat, not a street one), and she couldn't wait to get off the bike. We'll have to keep shopping around. And at the end of the day, Neda got her panniers back! They actually replaced the topcase and gave her a brand new one. The original one she had had a design flaw and is prone to cracking at the bottom where it joins the mounting bracket, thus allowing water in. As for the panniers, they explained that it's not the lids that leak when the panniers get bashed around, it's actually the seal around the mounting brackets on the inside. They re-waterproofed all the seals and spray-tested the boxes for Neda. And best of all, they did all of this no charge! Nice! She's been eyeing a pair of these for a while now, saying that the F650GS's bars are too low and she's hunched forward when riding. The F700GS that she was riding at the BMW Enduro Park course had raised bars and that really convinced her that it would be a good buy. 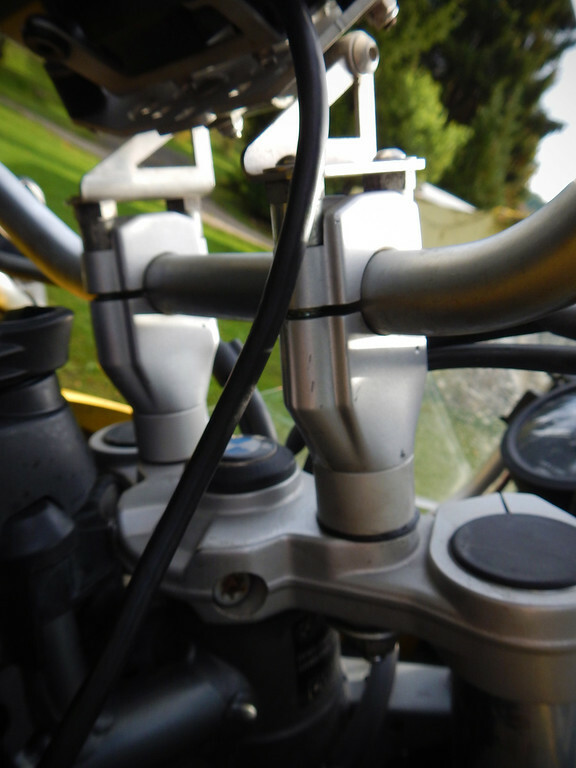 These Touratech risers lift the bars up 20mm. Not that much, but still noticeable. Slowly and surely, we're getting ourselves and all our stuffed fixed again. As for where our trip is headed next, we're still undecided. But what we really want to do right now is just see friends and hang out with them. 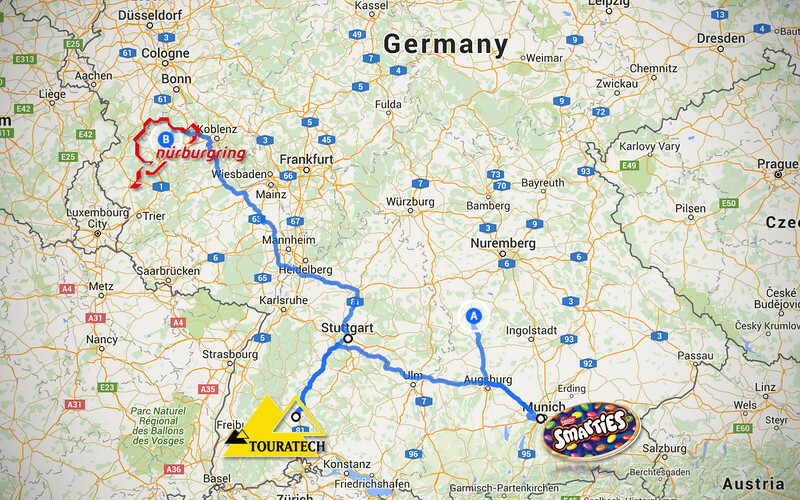 We have a lot of friends in Germany and earlier this year we were planning on doing a road trip to see all of them. But unfortunately Neda's chain snapped off in the Czech Republic. After getting that repaired, we ran out of time and had to rush back to catch a plane to Toronto. So for now, getting back to those plans is what we want to do. 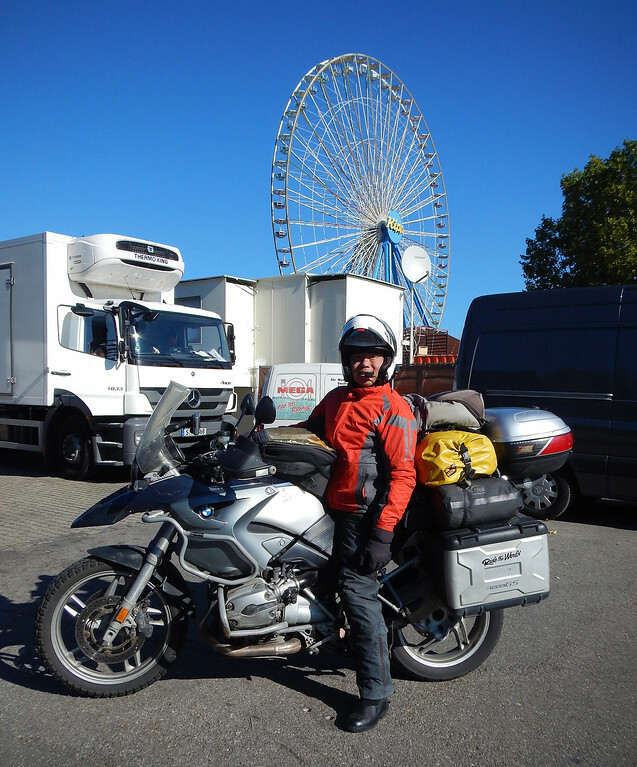 Carmen lives just outside of Stuttgart, only an hour away by Autobahn from the Touratech HQ. We're noticing the sun is setting so much earlier these days. And it's getting colder. Do we really want to go back to Canada just as the winter is approaching? 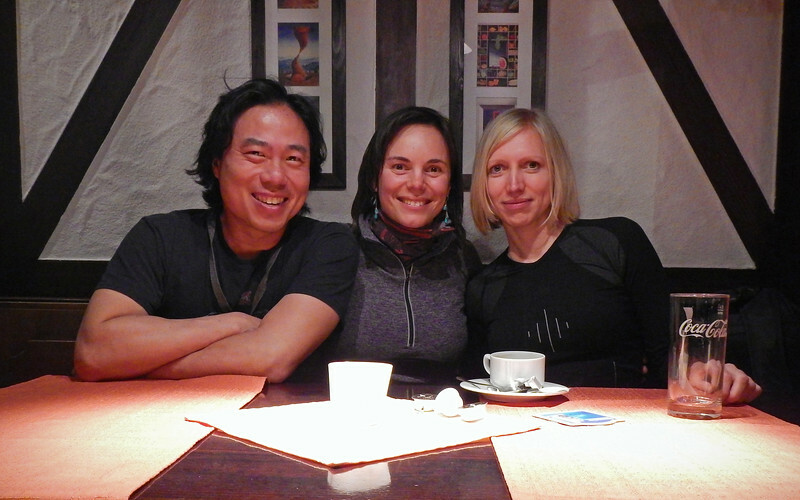 We first met Carmen on our first tour with the Stahlratte, sailing from Cartagena to Cuba. She had already taken a multi-month motorcycle trip through South America and was ending her trip by backpack. It's funny when you meet someone and instantly get along with them - even though we only hung out with her for such a brief time, that kind of easy friendship is so quick to spark up again, despite it being over two and a half years (!) since we last saw her. We had a great time catching up with Carmen. I like hanging around other long-term travelers because you don't have to explain the joys and the hardships of such a way of life. But because of the point of where we are on our trip, I was most curious about what life looked like after being on the road for so long. Although she's now got a job that she loves and has settled into a tiny apartment in town, she revealed to us that she misses being on the road all the time and that she's always dreaming and planning for the next big trip. I mulled that over for quite a while after we said goodbye to her for the night. 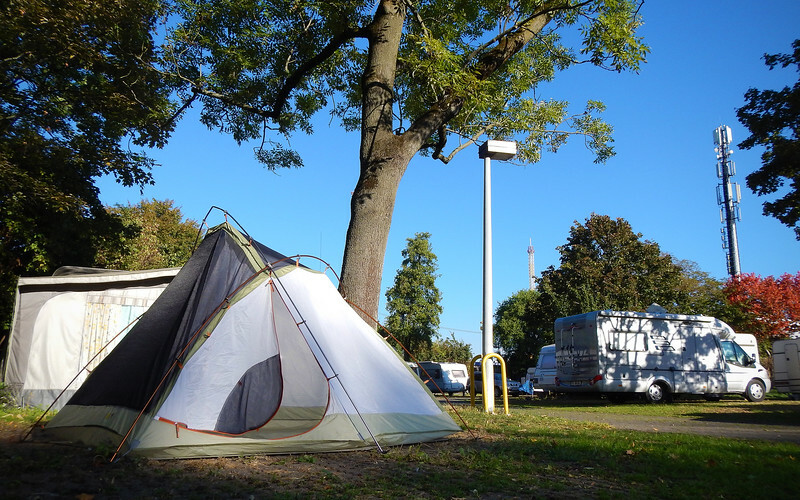 Earlier on, I had picked out a campsite where we could stay for the night, which was right in the city. But when we got there, we were surprised to discover a huge fair had been set up on the campgrounds! We were in Stuttgart right in the middle of their own Oktoberfest celebrations, called the Stuttgart Beer Festival. It didn't even occur to me that there would be celebrations outside of Munich! Uh oh. 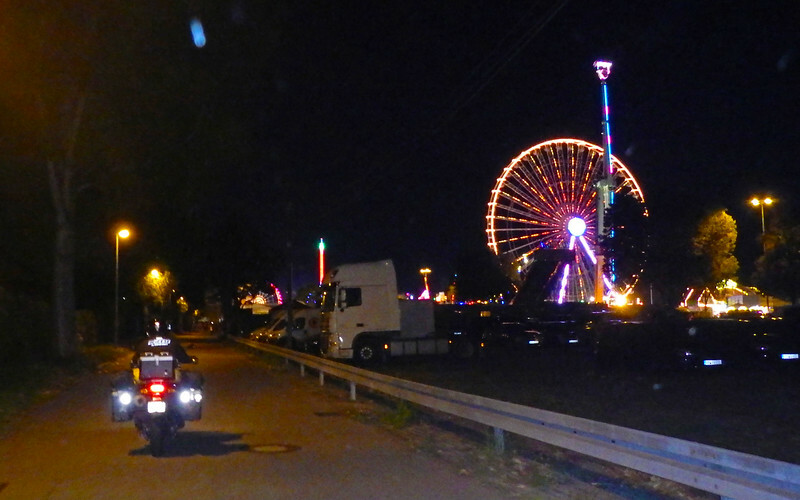 We rode around the carnival for a bit, dodging drunken Stuttgarters singing football songs, then spied a sign that indicated where the camping spots would be. It was actually in the parking lot of the fairgrounds, right amongst all the trucks that had brought in the amusement park equipment. The security guard at the parking lot told us the lot was full and we couldn't set up our tent there. Neda was using her German skills to try to find out where else we could stay for the night and I was consulting my GPS to look for the same. So here we were, 11PM in a new city, no place to stay. The hotels in the city during the Beer Festival would probably be all booked up or exorbitantly expensive. But funnily enough, I wasn't stressed out at all. 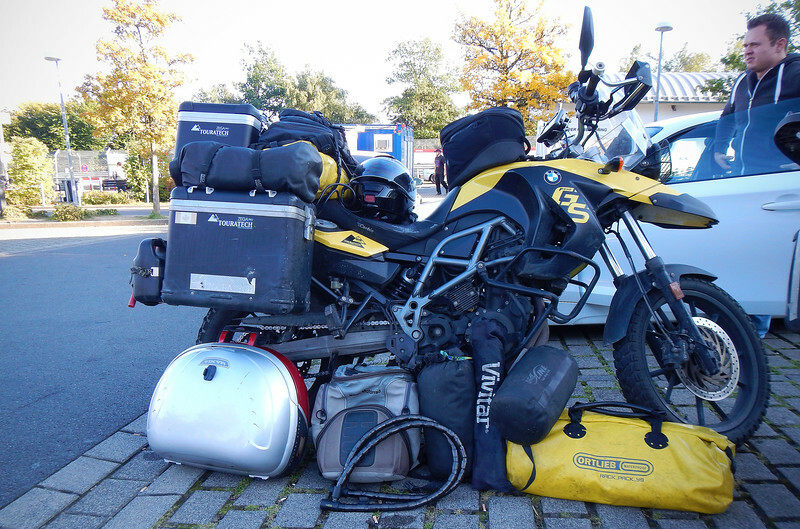 Lets go to Touratech Munich to fix your panniers. OK! Oh, we have to go the the Black Forest to get them fixed? OK! Let's visit our friends all over Germany now. OK! Oh, we can't sleep here tonight and have to find somewhere else? OK! I was kind of reminded of the very beginning of our trip when we were roaming around North America, absolutely no plan, just letting each day unfold and take us to the next place. This was kind of cool - experiencing that freedom once again. And stuff usually works out in the end. Neda got the security guard to talk to the campground manager and he let us stay for the night because we were just a couple of bikes and a small tent. We set up in a corner of the parking lot while the carnival slowly turned off all their lights to signal closing time. As we tucked ourselves into our sleeping bags, the football chants grew fainter and fainter as the revelers headed away from the park, presumably towards the bars. We've been having a lot of fun during these last few days. All packed up, ready for whatever's next! Goodbye Stuttgart Beer Festival! 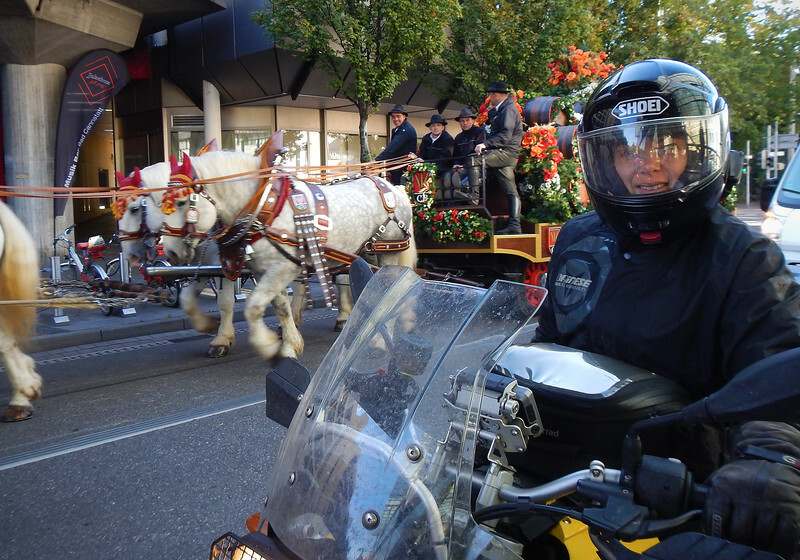 Trying to find our way out of Stuttgart, we caught a parade riding past us. The guys in the beer cart were just as curious about us as we were about them. We are back on the Autobahn to visit more friends in the north. ... the Nurburgring!!!! Yeah, baby! 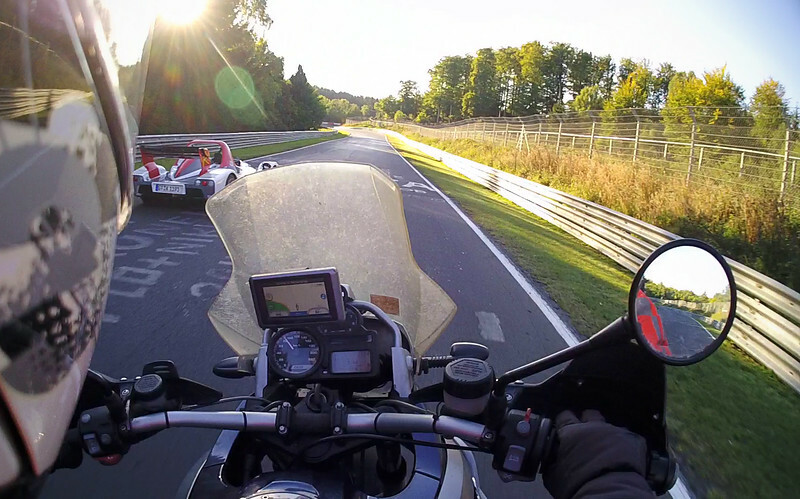 They used to race MotoGP on the Nordschleife, but stopped in 1980 because of safety concerns. 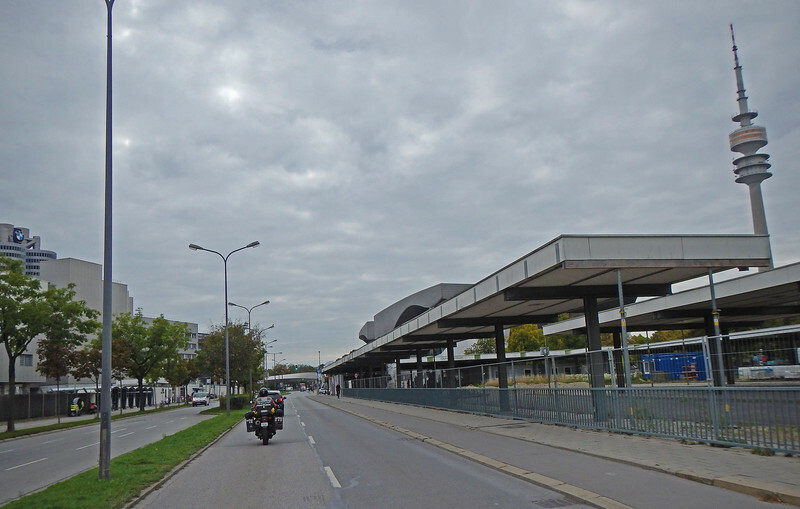 This was also the track where Niki Lauda crashed in 1976 and was the subject of the movie "Rush". That was the last F1 race ever held at the Ring. Despite no top-level events being run here, endurance racing is still popular at the Nordschleife and this is still *THE* place at which every sports car manufacturer tests their new models. The Nurburgring lap time is still considered the benchmark for sports car marketing literature and Top Gear episodes. 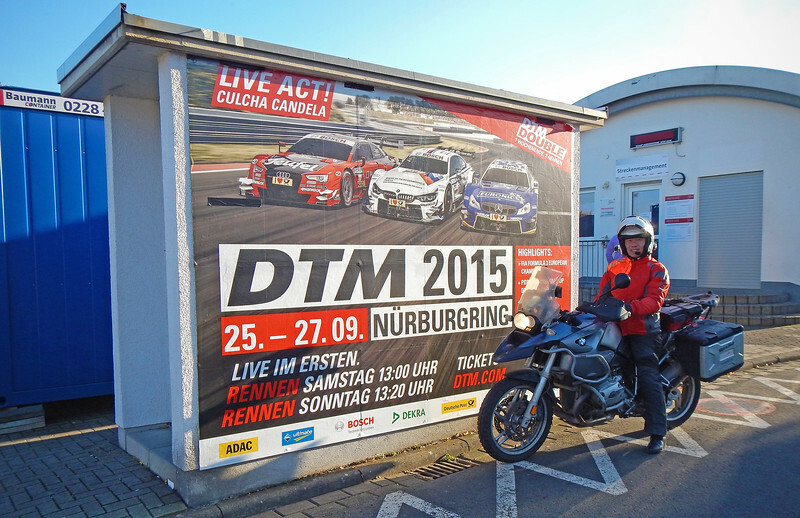 The Nurburgring parking lot is full of exotic (and some very commonplace) cars and motorcycles. Most of them use the parking lot as a tuning garage, adjusting sway bars, tire pressures, and whatever else they can tweak to shave precious seconds off their Nordschleife lap time. 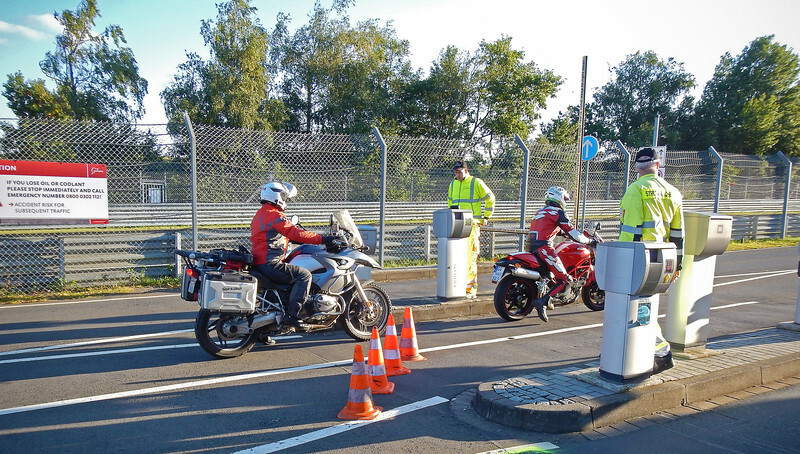 I didn't know the etiquette of the Nurburgring, until I saw the sign written on the barrier that opens up to the course: "German Traffic Law is Valid. Keep to the Right Lane". Ah, good to know! Anyway, instead of embarrassing myself with a 15 minute video of my 20km lap of the Nurburgring Nordschliefe (the motorcycle record is 7:10), here's an interesting car that passed me.